Great conditions out there today! I almost rode up the dirt road that seems to connect Sunshine Canyon to Linden Drive, but the "No Trespassing" sign dissuaded me. I may go from the other side to see if there's a portal. 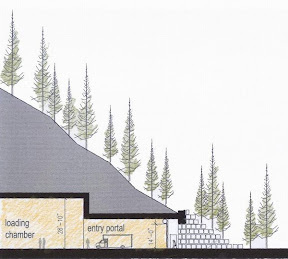 Speaking of portals, Frenzy Headquarters, a warren of subterranean vaults connected by steam tunnels deep under Norlin Quadrangle, has been beseiged with emails insisting we reveal our exact location on campus. While it is not possible to furnish you, O' Gentle Readers, with the precise coördinates of our HQ, lest we be smote by the clammy, bunker-busting hand of our dandy director, we can provide you with the faintest sketch of our inner sanctum, which shall permit the nimble-minded among you—with a pinch of Fancy, a dash of Reason, and a generous helping of Luck—to adumbrate our hidden lair. In point of fact, clues as to our whereabouts abound in Great Works of Art and Literature. 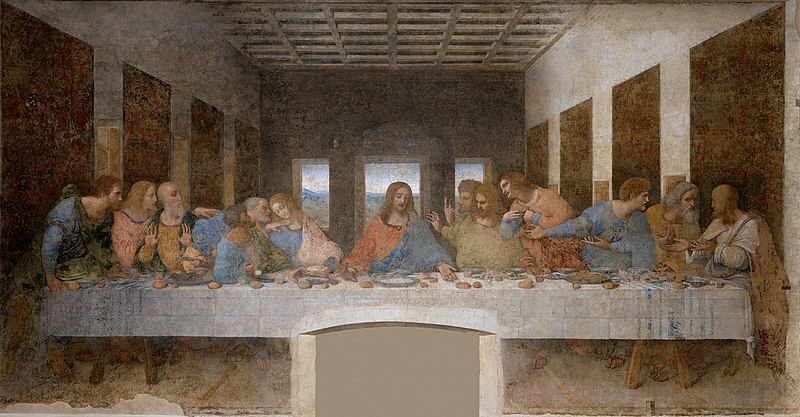 Take for example Da Vinci's Last Supper. Those familiar with Dan Brown's fiction are well-aware of the alleged female figure in Leonardo's chef d'œuvre. Though the notoriety generated by Mr. Brown's spurious work has certainly heightened the scrutiny the tempera on the walls of the Santa Maria delle Grazie now receives (leaving Frenzy Elders' nerves fricasséed, to say the least), the collective gaze of the curious is focused on the forest, not the trees. So, with the begrudging blessing of our Elders, I call your attention to the softest of brush strokes (whose subdued hue I cannot now precisely recall) just over the left shoulder of the apostle John, yonder where the wispy trees on the hill slope luff in the gentle Ponente winds. There is where you'll find it. Again, to the dismay of the Elders, I have taken the liberty of producing a facsimile of said strokes, confident that modern technology will fail to capture their revelatory Geist, thus further obfuscating the Truth. Train your eyes carefully, Gentle Readers! In the realm of Literature, there are more explicit directions. For instance, Poe's The Cask of Amontillado ostensibly recounts the descent of the injurious Fortunato into the catacombs of Montresors. Those with a fealty for the figural language of fiction will follow poor Fortunator down the wrong path. At the most remote end of the crypt there appeared another less spacious. Its walls had been lined with human remains, piled to the vault overhead, in the fashion of the great catacombs of Paris. Three sides of this interior crypt were still ornamented in this manner. From the fourth the bones had been thrown down, and lay promiscuously upon the earth, forming at one point a mound of some size. 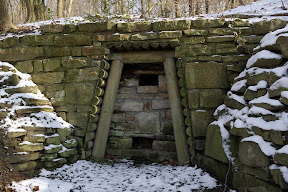 Within the wall thus exposed by the displacing of the bones, we perceived a still interior recess, in depth about four feet, in width three, in height six or seven. It seemed to have been constructed for no especial use within itself, but formed merely the interval between two of the colossal supports of the roof of the catacombs, and was backed by one of their circumscribing walls of solid granite. In November of 1997, one literal-minded soul entered the catacombs but didn't quite make it to our crypt. He left detailed instructions for those foolish enough to follow, though. A Frenzy Elder is clutching his chest complaining of acute pressure, so I must away. Perhaps I'll bump into you someday in a dank crypt, flambeau in one hand, bike in the other. In the meantime, stop pinging us for GPS coördinates!